concentration... Get to sleep easier. Are you ready to enjoy the life-changing benefits of White Noise, Pink Noise and Brown Noise? On this page, you'll find answers to common questions. You can also learn more about the science behind Noise Colors by checking out our Science page. What are the different "colors" of Noise? There are three major Noise "colors" used to help eliminate background distractions - White Noise, Pink Noise and Brown Noise. White Noise is the most well-known of all of these. The different "colors" are simply a way to classify the Noise, depending on spectral density. For example, White Noise typically has a flat spectrum over a specific frequency band. What are the benefits to listening to this Noise? 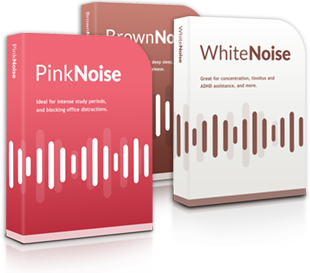 There are many known advantages to listening to White, Pink or Brown Noise - almost all of which are based on the primary benefit of eliminating background distractions. How do these special Noise sounds work? White, Pink and Brown Noise are special types of sound that are particularly effective at masking background distractions. They work by playing all audible frequencies at the same time, creating a sort of "fuzzy" noise. Because all frequencies have something "playing" in them, any other background sounds instantly lose their impact and become less distracting. You can learn more about White, Pink and Brown Noise on Wikipedia. What do White, Pink and Brown Noise sound like? White Noise sounds like TV static. Pink Noise sounds like a natural waterfall. And Brown Noise sounds like low-pitched ocean wind. You can listen to brief MP3 samples by clicking here: White Noise; Pink Noise; Brown Noise. This website sells MP3 recordings of White, Pink and Brown Noise. Every order can be instantly downloaded, and every purchase comes with a free usage guide and bonus "oscillation" recording. Yes. White, Pink and Brown Noise are simply just that — noise! If in doubt however, please seek advice from your doctor. How are your Noise recordings different to the rest? We believe that our Noise recordings are the best and most effective available on the market today. And we'd love to tell you why! Most White, Pink and Brown Noise recordings you find online are simply cheap loops, put together into a compilation. Others are generated by low-cost audio applications, without true consideration given to the goal of such recordings. Our recordings are different. Each of our White, Pink and Brown Noise recordings have been generated by expert audio technicians, with years of industry experience. They adhere to the exact mathematical specifications for generating the noise, for optimum results in masking background noise. Our White Noise has a spectral frequency of 1, with random values specifying the levels at every single point of every frequency. Our Pink Noise has a spectral frequency of 1/f, and Brown Noise has a spectral frequency of 1/f², and each follow their own specific level generation methods. Not only that, our recordings also utilize spatial stereo - which makes a huge difference to its effectiveness! Mono recordings are the most common type of White Noise recordings, because they're easier and quicker to create, and quicker to download. However, the sound being fed into both left and right audio channels is the same. Stereo recordings are more advanced, with independent noise being generated for both channels. all-encompassing effect which makes the recordings even more effective. In brief, we believe that our recordings are the best available because they adhere to the original mathematical method of creating Noise, and utilize spatial stereo encoding for absolute maximum effectiveness. Is this hypnosis or brainwave entrainment? No. White, Pink and Brown Noise are just special sorts of sound that help mask background distractions. There is no hypnosis or brainwave entrainment content in our recordings. In fact, colored Noise is perfectly natural, and can be found all around us. For example, rain often acts as White Noise, while waterfalls often create a Pink Noise effect. Absolutely. All of our recordings are guaranteed for a full 30 days. Does your website have an affiliate program? You bet. You can earn an affiliate commission of 50% for every single customer to you send to our website. Just click here to learn more and signup. Don't worry, we're always here to help. Just use the support beacon on the right hand side to get in touch with our support team. We promise to answer your query within one business day, although our typical response time is just four hours.